The Hamas movement has launched a slander campaign against Palestinian Authority chairman Mahmoud Abbas in response to Abbas’ close cooperation with Egyptian president Abdel Fattah el-Sisi against Hamas. Egypt accuses Hamas of helping the Ansar Beit al-Maqdis terror group carry out a major attack on the Egyptian army in Sinai at the end of October that killed 33 Egyptian soldiers. The Hamas journal quotes a PA source who claims Abbas has refrained from taking any measures against Israel in response to Ziad Abu Ein’s death because Abbas fears getting entangled in the affair and does not want to put a stop to the security cooperation with Israel. According to the source, Abbas knows that any move against Israel at this sensitive juncture will negatively affect the vote in the United Nations Security Council on the Palestinian-Jordanian statehood proposal. That is the headline of an article that appeared in Al-Risala on December 11, 2014. The article describes Abbas’ many disputes with his political opponents, which among other things, involve media gossip and spin that Fatah officials have disclaimed. According to the article, Abbas ordered the dismissal of the director-general of the Palestinian Legislative Council, Ibrahim Harisha, and instructed the Palestinian security forces to prevent him from entering the building of the legislature. Abbas ordered the imprisonment of Bassam Zacharna, commissioner of the clerks’ association in Ramallah. 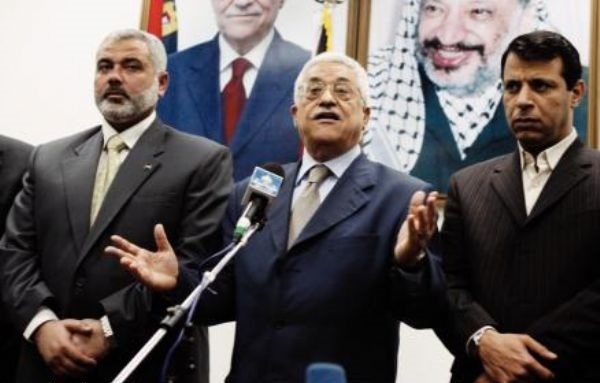 According to a document circulated and attributed to Abbas’ office, he ordered the PA’s security mechanisms to monitor the telephone conversations of several Fatah leaders because of his fears of his associates. The tension with Hamas: Abbas is not implementing the reconciliation agreement with Hamas, has relinquished the Gaza Strip, is not allowing the national unity government to operate there, and is preventing the rehabilitation of the Strip while vilifying Hamas. The rivalry with Mohammed Dahlan: There is tension in Abbas’ relations with el-Sisi stemming from the close ties between the Egyptian president and Mohammed Dahlan, Abbas’ sworn political foe. The tension grew after Abbas rejected el-Sisi’s request to mend fences with Dahlan and appoint him as his deputy. Abbas also lost the support of the United Arab Emirates, with which Dahlan has security and economic ties. Yasser Abed Rabbo, secretary of the Executive Committee of the PLO, tried to mediate between Abbas and Dahlan but he too failed. Political commentator Hani al-Basus asserts that the harsh criticisms of Abbas’ performance stem from the fact that he has reached the age of 80 without having achieved the minimum required of him on behalf of the Palestinian issue. In al-Basus’s view, Abbas is no longer suitable from a regional standpoint and many figures in the PA are competing for his post, including some who are acceptable to Israel, Arab countries, and the countries of the world. Abbas’ threats to turn to the UN Security Council have angered the United States, which has become wary of him in light of the ending of the negotiations with Israel and Abbas’s refusal to make concessions. Hani al-Basus believes that 2015 will be a pivotal year in the political life of Mahmoud Abbas, and that Arab countries as well as nations outside the region will force him into elections at the beginning of 2016. Al-Basus claims that Abbas’ popularity is dwindling and that his powers will gradually be wrested from him. Al-Basus says further that Abbas is stepping up the attacks on Hamas to prevent Dahlan from courting the Egyptian leadership, and he accuses Abbas of holding secret negotiations with Israel. To sum up, the slander campaign against Abbas reflects the great tension between Fatah and Hamas, which has reached an unprecedented level because of Operation Protective Edge, Hamas’s attempts to take over the West Bank (which were thwarted by Israel), and Hamas’ efforts to remain in power in Gaza while derailing the national unity government and foiling efforts to rehabilitate the Strip. Even if only some of the allegations that have been published are accurate, Mahmoud Abbas is still firmly in charge of the Palestinian Authority and the Fatah movement and is coordinating his moves against Hamas with el-Sisi. In light of Hamas’s difficult domestic situation, presumably the anti-Abbas media offensive will continue in an effort to delegitimize him among the residents of the territories.